This screen is accessed from the back-end Joomla! administrator panel. 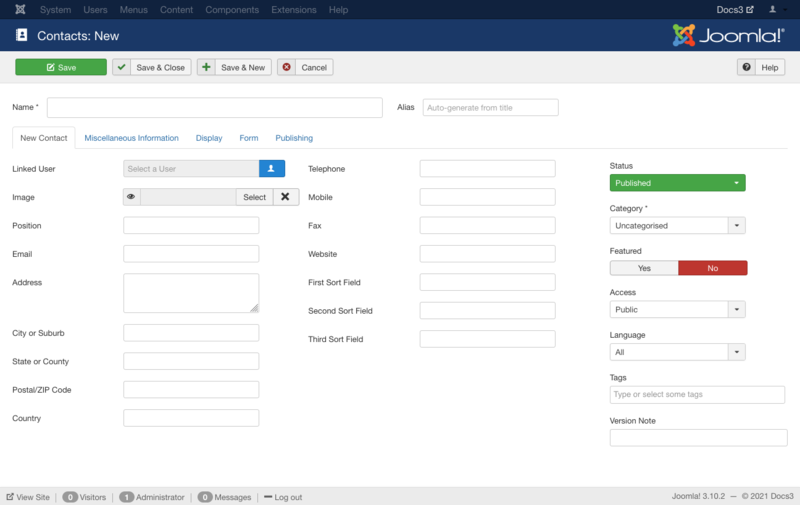 It is used to create or edit contacts in your Joomla! website. Click the 'New' button to create a new Contact. To 'Edit' an existing Contact, in Contact Manager click on an Contact's Title or click the Contact's check box and then click the Edit button in the Toolbar. This is where you can add a Contact or edit an existing Contact. Contacts allow you to list people on your web site. They also allow users to send e-mails to those people. In this section, you can enter information about the Contact, such as name, address, e-mail, and so on. The options allow you to control settings such as what information gets displayed for each Contact. Here you enter the basic information about the contact and its details. Name. The full name of the Contact. Alias. The internal name of the item, also used in the URL when SEF is activated. Normally, you can leave this blank and Joomla! will fill in a default value. The default value is the Title or Name in lower case and with dashes instead of spaces. You may enter the Alias manually. The Alias should consist of lowercase letters and hyphens (-). No blank spaces or underscores are allowed. Non-Latin characters can be allowed in the alias if you set the Unicode Aliases option to Yes in Global Configuration. If this option is set to No and the title includes non-Latin characters, the Alias will default to the current date and time (for example "2012-12-31-17-54-38"). Linked User. Select the User, if any, that this Contact is linked to from the drop-down list box. This allows you to link this Contact's information to a registered Joomla! User. If this Contact is not linked to a User, select "-No User-". Image. Image to display for this Contact. Select an image file from the drop-down list box. This lists images in the 'images/stories' folder. Images can be uploaded using the Media Manager. Position: The Contact's current position. Email. The Contact's e-mail address. Note that e-mail addresses in Joomla! can be protected from "spambots" by enabling "Content-Email Cloaking" in the Plug-in Manager. This is enabled by default. Address. The Contact's street address. City or Suburb. The Contact's town or suburb. State or County. The Contact's state or county. Postal/ZIP Code. The Contact's postal code. Telephone. The Contact's phone number. Mobile. The Contact's mobile phone number. Fax. The Contact's fax number. Website. The Contact's web site address. First Sort Field. The part of the name to use as the first sort field. Second Sort Field. The part of the name to use as the second sort field. Third Sort Field. The part of the name to use as the third sort field. Published: The item is published. This is the only state that will allow regular website users to view this item. Unpublished: The item is unpublished. Archived: The item has been archived. Trashed: The item has been sent to the Trash. Category. The Category this item belongs to. Featured. Whether or not the item will be displayed in featured view. A blue circle with a white star inside means yes and a gray circle with a white dot inside means no. Tags. Enter one or more optional tags for this item. You can select existing tags by entering in the first few letters. You may also create new tags by entering them here. Tags allow you to see lists of related items across content types (for example, articles, contacts, and categories). Version Note. Optional field to identify this version of the item in the item's Version History window. Other information about this Contact can be entered using the editor. Show Category. Show or hide the Contact's category. Show Contact List. Show or hide the Contact list. Display format. 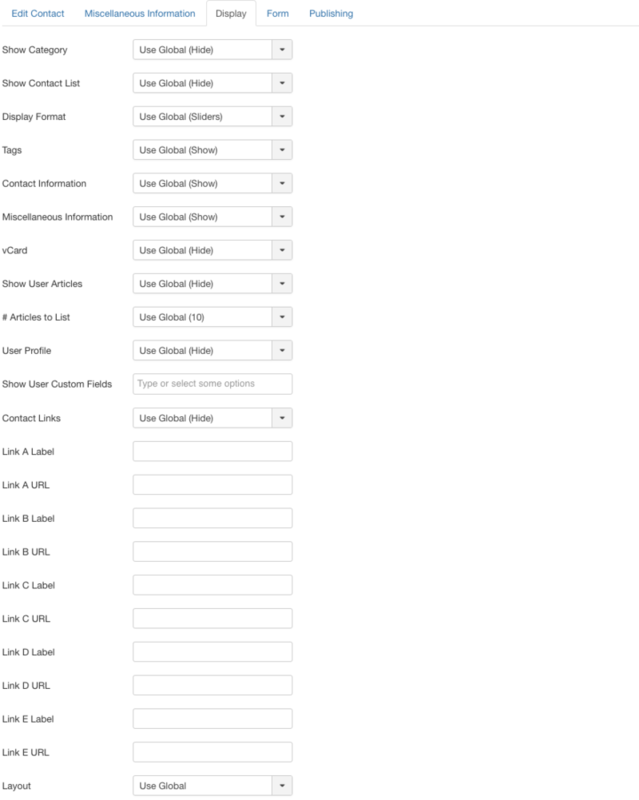 Determines the style used to display sections of the contact form. Tags. Show or hide the tags for this item. Use Global: Use the default value from the contacts options screen. Show: Show to allow users to select a contact in a drop down list. Hide: Do not display the Contact list. Contact Information. Hide or Show the Contact information. Miscellaneous Information. Hide or Show the Miscellaneous information. vCard. Hide or Show the vCard link for this Contact. Show User Articles. If this contact is mapped to a user, and if this is set to Show, then a list of articles created by this user will show. # Articles to List. Number of articles to list. User Profile. If this contact is mapped to a user, and if this is set to Show, then the profile of this user will show. Show User Custom Fields. Show user custom fields which belong to all or only selected field groups. Contact Links. Show or hide the contact links. Link A Label. Label for an additional link for this contact. Link A URL. The additional link URL for this contact. Link B Label. Label for an additional link for this contact. Link B URL. The additional link URL for this contact. Link C Label. Label for an additional link for this contact. Link C URL. The additional link URL for this contact. Link D Label. Label for an additional link for this contact. Link D URL. The additional link URL for this contact. Link E Label. Label for an additional link for this contact. Link E URL. The additional link URL for this contact. Layout. Use a different layout from the supplied component view or overrides in the templates. Contact Form. Hide or Show the E-mail form. If Show is selected, a form is displayed that allows the user to send an e-mail to the Contact from the web site. Banned Email. Enter any e-mails to be banned from the site. E-mail addresses containing any of the listed text will be banned. Separate different words with semi-colons ';'. For example, the entry "spam;junk" would ban e-mail addresses such as "myspam@.com" or "aeddie@junkisgood.com". Banned Subject. Enter any e-mail subject words to be banned from the site. Separate different words with semi-colons ';'. For example, the entry "spam;junk" would ban e-mail subjects such as "This is not spam" or "I Like Junk". Banned Text. Enter any e-mail text words to be banned from the site. Separate different words with semi-colons ';'. For example, the entry "spam;junk" would ban e-mail content such as "This is not spam" or "I Like Junk". Session Check. Check for the existence of session cookie. This means that users without cookies enabled will not be able to send emails. Custom Reply. Turns off the automated reply, allowing for Plugins to handle integration with other systems. Contact Redirect. Enter an alternative url, where user will be redirected to after the mail is sent. Created Date. This field defaults to the current time when the Article was created. You can enter in a different date and time or click on the calendar icon to find the desired date. Created By. Name of the Joomla! User who created this item. This will default to the currently logged-in user. If you want to change this to a different user, click the Select User button to select a different user. Created by Alias. This optional field allows you to enter in an alias for this Author for this Article. This allows you to display a different Author name for this Article. Modified Date: (Informative only) Date of last modification. Modified By: (Informative only) Username who performed the last modification. Revision. (Informative only) Number of revisions to this item. Meta Description: An optional paragraph to be used as the description of the page in the HTML output. This will generally display in the results of search engines. If entered, this creates an HTML meta element with a name attribute of "description" and a content attribute equal to the entered text. To help Search Engines and other systems classify the content of the Article. Add the keywords 'dog' and 'cat' to the appropriate Articles. 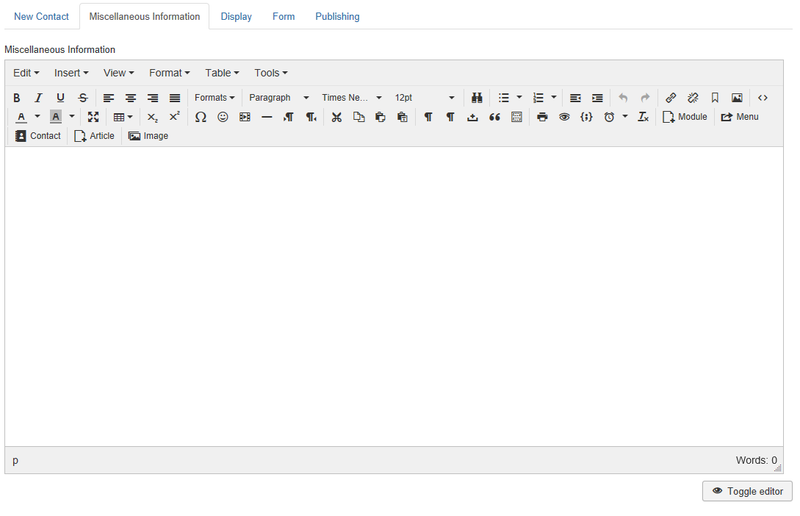 Add the Tags 'dog' and 'cat' to the appropriate Banners in the Banner Manager New/Edit screen. Set the Banner module Parameter 'Search By Tags' to 'Yes' in the Banner Module Edit screen. For articles only, in combination with the Related Articles module, to display Articles that share at least one keyword in common. For example, if the current Article displayed has the keywords "cats, dogs, monkeys", any other Articles with at least one of these keywords will show in the Related Articles module. Robots: The instructions for web "robots" that browse to this page. Use Global: Use the value set in the Component→Options for this component. Index, Follow: Index this page and follow the links on this page. No index, Follow: Do not index this page, but still follow the links on the page. For example, you might do this for a site map page where you want the links to be indexed but you don't want this page to show in search engines. Index, No follow: Index this page, but do not follow any links on the page. For example, you might want to do this for an events calendar, where you want the page to show in search engines but you do not want to index each event. No index, no follow: Do not index this page or follow any links on the page. Rights. Describe what rights others have to use this content. Save. Saves the contact and stays in the current screen. Save & Close. Saves the contact and closes the current screen. Save & New. Saves the contact and keeps the editing screen open and ready to create another contact. Save as Copy. Saves your changes to a copy of the current contact. Does not affect the current contact. This toolbar icon is not shown if you are creating a new contact. Versions: Opens the Item Version History window to show any prior versions of this item. This allows you to view older versions of this item and, if desired, restore from an older version. See Version History for more information. At least one Contact Category must be added before adding the first Contact. Components Contacts Categories The Contact Category Manager is where you can edit existing Contact Categories and create new ones. Note that Contact Categories are separate from other Categories, such as for Articles, Banners, News Feeds, and Web Links. From this screen, you can also navigate to theContact Manager: Contacts screen. Components Contacts Categories Edit This is where you can add a Contact Category or edit an existing Contact Category. Contact Categories allow you to organize contacts in your web site. Contact Categories are separate from other types of Categories, such as those for Articles, Banners, News Feeds, and so on. Components Contacts Contacts The Contact Manager screen allows you to add contact information to your Joomla! site. You can enter information such as name, address, phone and e-mail. You can also link contacts to registered users. Afterwards, you can use the Menu Manager to create front-end links to the the contacts. This page was last modified on 19 November 2018, at 15:21.